The Pound and Euro are set to rise only slowly over the coming year while the US Dollar will continue to reign supreme over currency markets for a while yet, according to the latest currency forecasts from Natwest Markets. Natwest Markets, the investment banking arm of Royal Bank of Scotland, predicts in its mid-year currency outlook that the regime change seen in markets during the first half of the year is here to stay. This means the US Dollar, backed by a hawkish Federal Reserve, will continue to sweep away all opposition to it during the months ahead. Meanwhile the Pound will be beset by uncertainty over the likely outcome of the Brexit negotiations and its eventual consequences. Across the English Channel, the Euro is seen gripped by lethargy over the coming quarters as the European Central Bank continues to sit on its hands, keeping the bloc's interest rates at their post crisis lows until late in 2019. The Pound-to-Dollar rate was quoted 0.07% higher at 1.3115 Tuesday while the Pound-to-Euro rate was down 0.12% at 1.1218. The Euro-to-Dollar rate traded 0.06% lower at 1.1686. "Brexit-related developments look set to dominate and uncertainty is high. While the BoE may raise interest rates in August, we doubt that monetary policy developments will be a major driver, as they are in turn dependent on Brexit developments." "Brexit-related risks may come to a head in the latter months of 2018, as volatility rises over an increasingly binary outcome and markets lack the risk appetite (or are unable to) price incremental changes to the Brexit path. This means that final outcome of Brexit may deliver a larger shock to markets than initially thought." "The USD was stronger than we expected in H2 ’18, with the cyclical outperformance of the US economy and shrinking USD liquidity outweighing longer-term USD headwinds. It also came alongside increasing fears of protectionism globally, and increased political risks in Europe." "We are confident that the rest of the world re-accelerates, relative to the US, over time. As the Fed becomes more fully priced, the focus is expected to return to the potential for global monetary policy tightening, and this can shift the focus once again to long-term USD headwinds." "International investors are fundamentally long USD assets through funding the US’s twin deficits. However, these appear stretched relative to non-US assets, such as EM equities, and will pose further potential headwinds to the dollar. 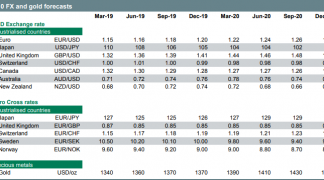 These factors will prove supportive for EUR/USD through 2019." "The possibility of the ECB finally raising interest rates (in Q3’ 19) is seen to provide support, as will the prospect of US interest rates approaching their terminal, neutral rate. However, while the Fed becomes more fully priced, the USD can stay a little stronger for a little longer."